Note! For an introduction about how PVR (Personal Video Recording) support works in Kodi and more information on its "PVR frontend" concept of using a 'client–server model' to connect to third-party "PVR backend" servers, please see the main PVR page. To summarize; To receive a television signal via either satellite, cable, or OTA (over-the-air) using an television antenna, you are going to need a physical TV-tuner adapter/card. Kodi as a "frontend" media player software does not have its own embedded TV-tuning functionality to receive, decode, and record such signals directly by itself. Kodi instead relies on external third-party TV-tuning software or network-attached TV-tuner to serve a video stream to Kodi, and such third-party software is here referred to as a "PVR backend" (also sometimes called a "PVR server"), which can be software or a hardware-appliance. If you go the route to install with a PVR backend software instead of using a network-attached TV-tuner in the form of a hardware-appliance, then you can in most cases choose to either install the "PVR backend" software on the same computer as Kodi or install the the "PVR backend" software on another computer, just as long as Kodi can access the "PVR backend" software on the same local network. Once you have chosen where you want to install the PVR backend software, you have to choose which software you want to install. The only prerequisite for Kodi is that the PVR backend software already has a "PVR client addon" available to act as middleware to connect Kodi's own PVR interface with the PVR backend software. The PVR backend software will also have prerequisites of its own, as it at least needs to run on the operating system you want to use and support the TV-tuner adapter/card. Understand that there are today many different PVR backend software available that are compatible with Kodi, (which they do by having a "PVR client addon" available for Kodi), but on this wiki page we cannot recommend which specific PVR backend software is best suited for you; because it depends on many things. One recommendation we can however give is to try to choose which PVR backend software and operating system that you will use before you go out and buy any TV-tuner adapter/card hardware. Please make a new post in Kodi's community forum with all information about your exact location, television signal type, needs and preferences, if you are looking to get more specific recommendations. With the exception of Android, you can run the PVR backend (PVR server) software on one of your existing Kodi installs, or otherwise run the PVR backend (PVR server) software on its own computer/appliance and connect over your local network. Use the tables below to lookup supported PVR backend software for each operating system and click on each PVR backend software to read more about it, to see if it looks like it might fit your needs . If you want to receive a TV signal OTA (over-the-air) using a television antenna, then you should begin by taking note of exactly which type of broadcast standard signal is used in the country and region in which you are. 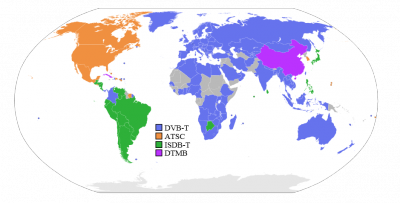 This map will give you a basic idea of what to look for, if you are unsure what broadcast standard your digital terrestrial television signal format is in (over-the-air signals). We are sorry to have to inform you there are unfortunately not yet any generically compatible PVR backend software applications that run natively on Android and have a PVR client addon for Kodi. Android is currently only added here on this page because requests and enquiries about PVR backends for Android that are compatible with Kodi are one of the most frequently asked questions. If you want to get access to Live TV, EPG and the other PVR features in Kodi running on Android today, then you currently either need to use an IPTV (Internet TV) client or use a workaround such as running your PVR backend on another computer or appliance/device on your local network in order to stream the video to Kodi running on Android, (you can, for example, run PVR backend (PVR server) software on a Raspberry Pi or mini-PC). The Raspberry Pi series is technically just ARM-based embedded Linux platforms, but their low price and very capable hardware make it almost perfect as a PVR backend server for Kodi. In addition to this, since a lot of people are using Raspberry Pi and Raspberry Pi 2/3 as PVR backend servers, it makes it much easier for the Kodi community to streamline setup guides and provide help to use Raspberry Pi as PVR backends, due to most of the hardware being the same for everyone. For compatibility and links to these guides, please see the Linux matrix above and the community forums. Like every PVR backend, the server needs to receive the live tv signal from a receiver. A typical TV tuner USB stick will do, but be aware that such a USB stick takes its power supply via the USB interface. You might be required to put a USB hub with an independent power supply between the Raspberry Pi and the TV tuner USB stick. Make sure that the TV tuner USB stick you choose to buy works with both Linux OS and the Raspberry Pi hardware. Much more information can be found at http://linuxtv.org which also includes firmware downloads for many TV tuner USB sticks which need to be placed on the SD/USB storage for the Linux operating system you use on the Raspberry Pi. Alternatively, you may want to check the directory /lib/firmware on the Raspberry Pi to list the firmware already installed. /var/log/dmesg and .kodi/temp/kodi.log are files to check if the TV signal is not available. Simplest is, just attach TV tuner USB sticks directly to the Raspberry Pi and install a Kodi centric distribution, such as LibreELEC, as they normally include not only a Linux operating system with Kodi and all the correct drivers/firmware, but usually also ships with a scripted installation of Tvheadend or similar PVR backend that is automatically installed when choosing to install the corresponding PVR client addon inside Kodi. However, the best idea might be to use a dedicated Raspberry Pi with a simple Linux distribution acting only as a PVR backend server with TV tuner USB sticks directly attached to the Raspberry Pi and nothing more than the PVR backend software installed, including no Kodi install on it, in a headless configuration (meaning no TV or monitor display connected); that way, you can still access it over the network and it can use all of its CPU and memory resources to handle serving as a PVR backend server. EyeTV (EyeTV IPTV Server) Yes ? ? ? ? ? ? ? ? ServerWMC (Server interface for Windows Media Center) Yes Yes ? ? Yes ? ? Yes ? Other PVR backends include IPTV clients, standalone network attached television tuners, and PVR recording software available in app stores NAS devices or similar home server appliances. HDHomeRun unofficial native PVR client Yes ? ? ? No Yes ? ? ? PCTV Systems Broadway Yes ? ? ? No Yes ? ? ? Njoy N7 Yes ? ? ? No Yes ? ? ? ↑ VNSI supports full time shift. XVDR "XVDR Plugin for VDR" does. ↑ 2.0 2.1 Via Silicondust HDHomeRun Prime, the Hauppauge WinTV DCR-2650, or the Ceton InfiniTV 4. ↑ Via Silicondust HDHomeRun Prime, the Hauppauge WinTV DCR-2650, or the Ceton InfiniTV 4. This page was last edited on 19 January 2019, at 19:10.